Tim Cook just unveiled its new installation of iPhone device. Apple kept a great deal of interest even from those who have never bought any of its flagship device. Tim Cook introduced new iPhone in its famous style and the crowd gone crazy. It was interesting to see that most of the rumors about the new iPhone 7 before its launch were actually true. Despite that, these new iPhones will gonna be in your wish list with the kind of features that this new iPhone 7 and iPhone 7 Plus is having. Apple has done a tremendous job in crafting the new iPhone 7. It is looking stunning with the new design revamp. The new iPhone 7 is constructed with incredibly strong 7000 Series aluminum. You can’t take your eyes off the stunning looking iPhone. The enclosure is splash and water resistant and the Home button is completely reengineered. The jet black finish in the iPhone 7 is like nothing we have ever seen. Its available in Black with a matte finish, High gloss jet black, silver, gold, and rose gold finishes. As rumored, the home button here is similar to the Force Touch trackpad on the Mac. It’s force-sensitive and unmoving. It, too, has a vibrating “Taptic” engine to give you feedback meant to simulate an actual button press. 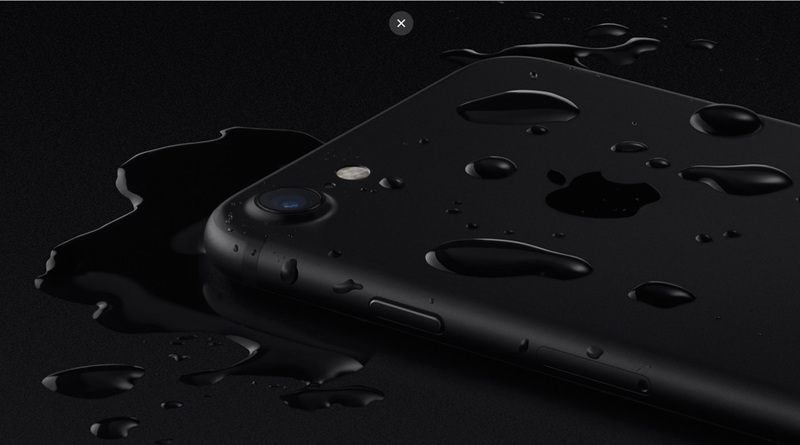 With the new enclosure reengineered the new iPhone 7 is water and dust resistant. Like other waterproof phones in its class, it meets IP67 waterproofing standards. There is no more fear of spills, splashes and even dust. 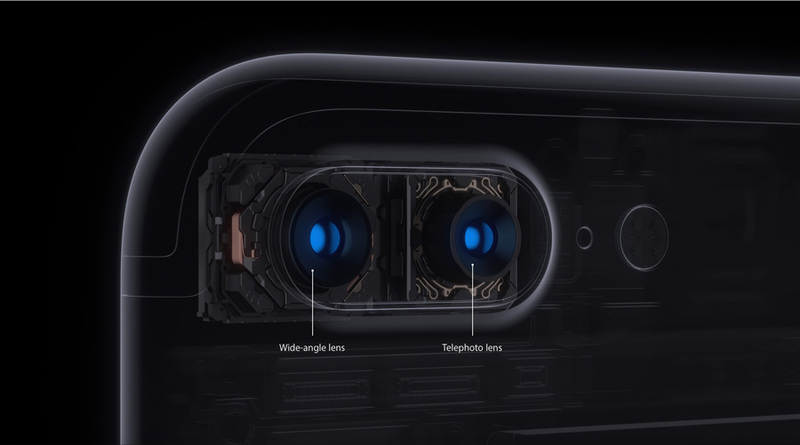 Apple has designed the new camera system for iPhone 7 and iPhone 7 Plus each. With its 12 megapixel sensors, optical image stabilization, f/1.8 aperture, six element lens, high speed sensor, Quad-LED true tone flash and wide color gamut make iPhone 7’s camera best in any smartphone ever. The iPhone 7 Plus camera on the other hand has 2 cameras that shoot as one. The same 12MP wide-angle camera that’s on iPhone 7 works with a 12MP telephoto camera that can achieve high-quality zoom from farther away. And the new depth-of-field effect (coming soon as a software update) makes it even better. The new wide color gamut, 3D touch and 25% brighter screen make it to deliver cinema-standard colors. 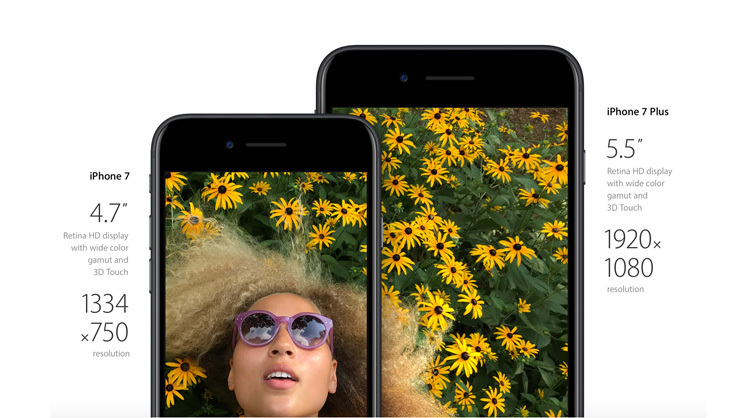 Apple is claiming the wide color gamut to be the best color management in the smartphone industry. 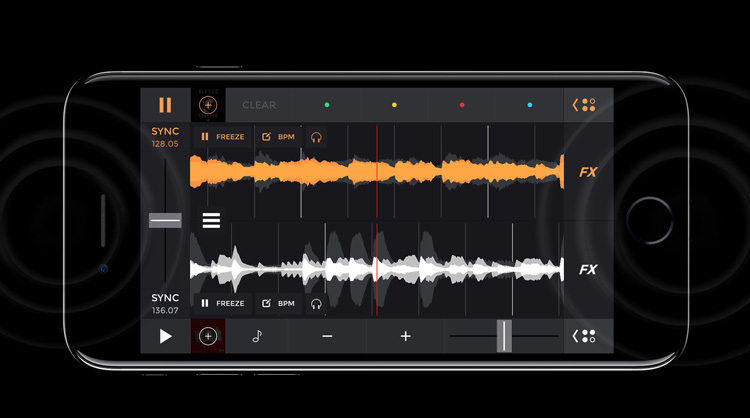 Apple iPhone 7 sports new stereo speakers boasting twice the volume of iPhone 6s model, along with a wider range. EarPods that have a Lightning connector will be shipped in the iPhone 7 box. But if you still want to listen through your old headphones, you can plug them in using a 3.5 mm headphone jack adapter, which will also be included in the box. The new iPhone 7 is powered by the new chip designed by Apple called A10 Fusion chip. It is more efficient and its faster than the previous generations of the chips. iPhone 7 is said to have longest battery life ever in any iPhone. 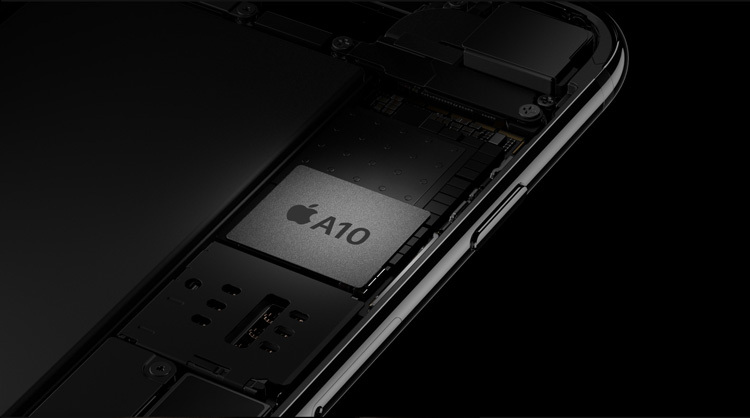 A10 Fusion chip’s CPU has two high‑performance cores and two high‑efficiency cores, the high‑performance cores run at up to twice the speed of iPhone 6 and high‑efficiency cores consumes the one-fifth the power of the high‑performance cores. 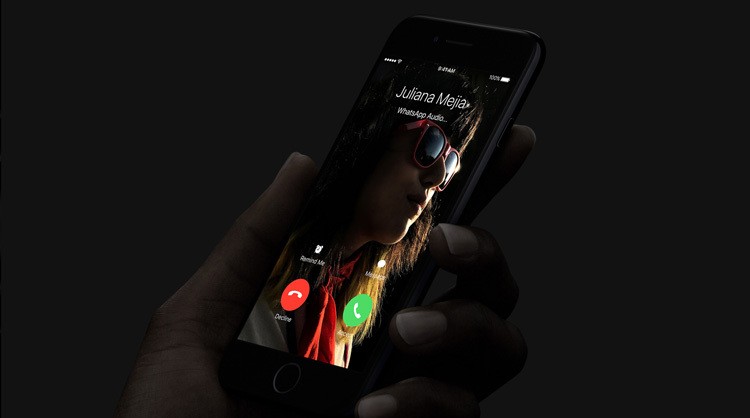 Apple iPhone 7 features advanced LTE that can speed up to 450 mbps data downloads. It is 3 times faster than that of iPhone 6 and LTE supports up to 25 bands which will be helpful in worldwide roaming. Since iPhone 7 supports VoLTE which is high-quality calls, conversation over phone will sound way much better. One of the good feature of iPhone is that it can answer calls from Whatsapp, Facebook etc like regular calls including call waiting.